How do I add auto-labels to submissions? Auto-labels help you easily find and organize submissions. Organizations can automatically label submissions based on the responses that a submitter selects on the submission form. For example, you can now automatically label submitters by demographics such as gender or country of residence. If you're a level 4 or 5 administrator, go to your Forms tab and click on the name of the form you want to edit. In the Form Designer tab, add a radio list, dropdown menu, checkbox, or checkbox list field to your submission form, and select the Auto-Label checkbox. 2. When the Auto-Label checkbox is selected, each optional answer you ask for in your field will be automatically applied as a label to the corresponding submission if the respective submitter selects that option. For instance, in this radio list, "Female," "Male," and "Other" are three possible labels. 3. 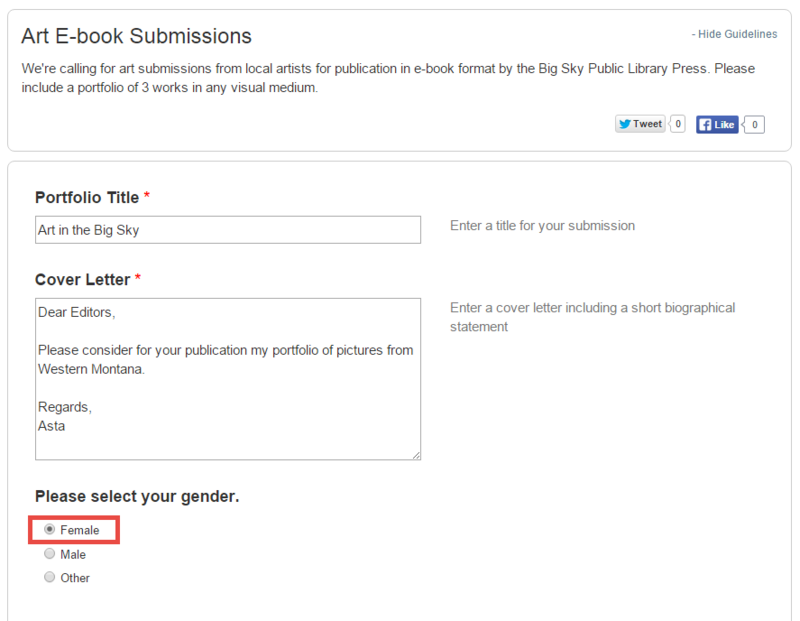 During the submission process, the submitter will select his or her answer in your submission form. 4. In your submission manager, the submission will be automatically labeled with the option(s) that the submitter chose. Note: The text in labels is limited to 25 characters each. If an optional answer in one of your auto-label fields contains more than 25 characters each, the text will appear as normal in your submission form, but the text of the label that appears in your submission manager will be truncated to 25 characters. Not all Submittable accounts include the auto-label feature. If you're interested in adding auto-labels to your plan, contact our sales department at sales@submittable.com.